When you have a pimple on your head, you usually discover it because it hurts. Causes of these irritating blemishes include allergies, shampoos, dandruff, over-active oil glands and other irritants. Often, they resolve on their own, but occasionally painful pimples need to be treated or else they won't go away. If over-the-counter remedies don't work, you may have to see a medical professional for advice. The most common culprit for the development of painful pimples on head or hairlines is over-active oil glands. The oil mixes with dead skin cells, causing clogs in your hair follicles. This combination provides bacteria with the food they need to create a blemish. If you sweat a lot or have an oily scalp, you have a greater risk of developing pimples on your head. When your scalp comes in contact with an allergen or irritant, you can develop blemishes on your scalp. The method of exposure includes both ingestion and direct skin contact. For example, if you are allergic to a specific food, you can develop painful blisters on your head as well as other parts of your body. It is evident by a bunch of bumps, either scattered or grouped together. When a hair follicle is either damaged or blocked, a cyst can form that resembles a pimple. The resulting lump secretes white discharge like a blemish would. Tender to the touch, these cysts can become red and inflamed, causing discomfort and pain. Tinea capitis is a condition also referred to as ringworm. Symptoms include flaky skin on your scalp, an odd odor, itching, scabs, balding areas on your head or bumps filled with pus. It can also spread to other areas besides your head. A contagious condition, children are at a greater risk because they tend to share hats, barrettes, headbands and other items with other people. Cures include medicated cleansers like shampoo or oral medications. Folliculitis can form if hair follicles are clogged by dead skin cells or damaged by excessive rubbing or friction. Signs of the condition include redness, itching and white blemishes filled with pus. Often seen on the scalp, folliculitis can also occur on your face, groin, thighs or other areas of your body. Although usually curable with home remedies, if persistent, you may need treatment from your doctor. An often used ingredient in lotions or washes designed for acne treatment is benzoyl peroxide. If you are experiencing painful pimples, you may be able to cure it by applying a treatment containing the bacteria-killing solution. In addition, benzoyl peroxide can rid your scalp of dead skin cells and oil. Alpha hydroxy acids come in two forms: lactic acid and glycolic acid. Both can be found in acne treatments, ranging from low to high concentrations. The more concentrated the solution, the greater the amount of caution should be used. Alpha hydroxy acids reduce skin irritations and can wash away old skin cells. Research has shown they may help with new skin cell generation and smoother skin. Sulfur has been found helpful for many who suffer from pimples. It helps remove excess scalp oil and dead skin. Rarely used on its own, it is typically combined with other acne-fighting ingredients in medications, solutions or washes. One thing to consider is sulfur products usually have an unpleasant or odd odor. 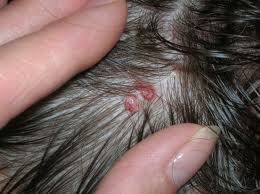 Painful pimples on scalp may need to be treated by a specialist, most likely a dermatologist. Treatment differs depending on the underlying condition or cause. If you are suffering from tinea capitis (ringworm), you will need to use an antifungal shampoo. If this does not clear up the blemishes, you may need to take an oral medication as well. Folliculitis is treated with an oral antibiotic as it is a bacterial infection. Medicated washes, ointments and shampoos are used to cure contact dermatitis as they are surface irritations. An epidermal cyst is treated with steroid injections and possibly surgery to drain the pus or fluid. If the cyst continues to cause you discomfort or keeps reoccurring, it may need to be surgically removed. If you suffer from painful pimples on scalp, you should wash your hair daily to prevent oil build-up and remove dead skin cells. If daily washing dries your skin out, you can try every other day. Another thing to consider is while conditioners are good for your hair, they can cause an oily scalp. If you experience pimples after washing your hair or using hairspray, avoid the products you are using as they may be the cause. Hair products contain a lot of chemicals, some of which can cause an allergic reaction. If you know you are allergic to a specific ingredient, check labels closely before using or purchasing a product. Water-based products that won't clog your pores and are less prone to irritate your skin. Avoid applying hair products close to your scalp, but rather apply to hair away from skin like on your strands. Some people must wear hats or helmets due to the type of work or sports they engage in. If you think painful pimples on scalp are developing because of your head gear, try to let your scalp breathe when you can. You can also wear a moisture-absorbing hair cover or headband under your hat to help draw the excess sweat and oil from your scalp. 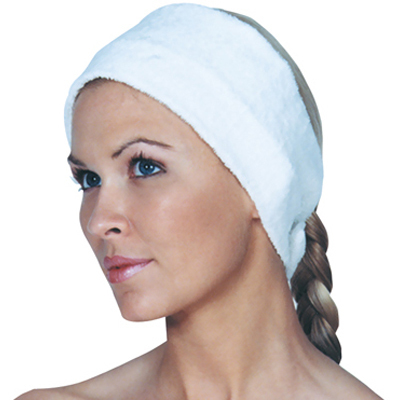 Washing your hair as soon as you remove your head gear can also help prevent blemishes from forming on your scalp. 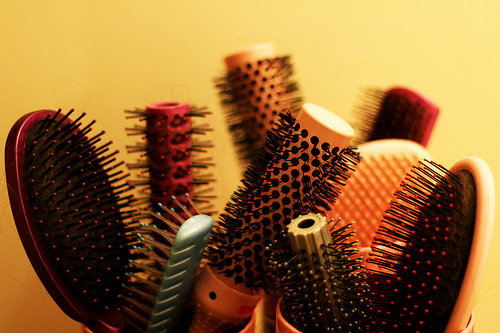 When you brush your hair on a daily basis, you comb out old and dead skin cells that cause clogging of your follicles. You also separate hair strands that have clumped together because of excess oil. This allows your scalp to breathe and reduces your chances of head pimples.